President Barack Obama has a birthday coming up soon. 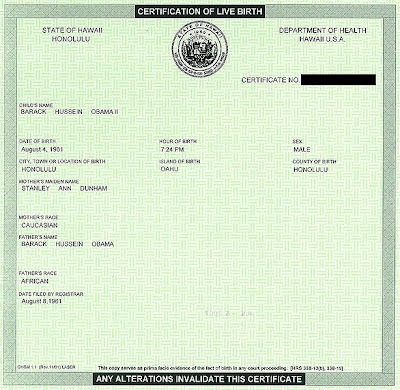 I know because I have his birth certificate right here showing that he was born on Aug. 4, 1961 at 7:24 p.m. on the island of Oahu in Hawaii. That’s part of the United States of America, in case you didn’t know. Apparently some people don’t know and they are still questioning whether Obama is a natural born citizen and thus eligible to be president, like the crazy lady in this Youtube video who screeches at poor Congressman Michael Castle, a moderate Republican from Delaware, while he is trying to conduct a town meeting on health care issues. The part where the crazy lady interrupts the meeting a second time and forces everyone to stand up and recite the Pledge of Allegiance is downright creepy. But these “Birthers,” as they are becoming known, are becoming more and more predominant in the Republican Party. So much so that we now have Republican members of Congressman trying to appease them with legislation that would supposedly require future presidential candidates to “prove” their eligibility. But the crazy people aren’t going to go away that easily and they have prominent media figures like Rush Limbaugh, Liz Cheney and Lou Dobbs embracing their cause. I understand why so many people consider themselves to be “conservative” having been there once myself. The term “conserative,” unlike its political counterpart “liberal,” has appeal to both sides of the political spectrum. People on the left side of the political spectrum will readily embrace the term ‘conservative’ in many respects, while the reverse is rarely true. No one wants to be called a “fiscal liberal.” That’s like being called a spendthrift, or someone who is wasteful with the people’s money. And conservatism is often equated with good moral values. Someone who lives a “liberal” lifestyle is usually viewed as being immoral. Conservatism even has good connotations in the context of environmentalism such as conserving land, conserving resources and conserving species. The term “liberal,” on the other hand, has been so denigrated over time that even many people on the left have opted to abandon it in favor of terms like “progressive” or “moderate” to distinguish themselves from the dominant rightwing ideology. Gross caricatures of liberalism abound throughout our culture and are constantly reinforced by the vast web of rightwing media which includes nearly all of talk radio, most of cable news and the majority of newspaper op-ed pages. Even the funny pages are rife with demeaning liberal caricatures propigated by rightwing strips like Mallard Fillmore, Prickly City and B.C. Liberals are typically viewed as being uppity, arrogant elitists who reject traditional social mores and want to force their own moral absolutism onto everyone else. Liberals are supposed to be anti-religious, or at least anti-Christian, and enemies of traditional “family values.” Liberals are usually unreformed Hippies with long hair pulled back in a pony tail. The mean wear earrings, the women avoid bras. They are anti-military, anti-patriotic and hold protests where flags are burned and soldiers are spat upon. Liberals are anti-business and want to take the country in the direction of “socialism.” If they get into the government, they immediately try to raise taxes and give all the money away to undeserving constituent groups - thus punishing the successful and the hard-working people to benefit the lazy degenerates of society. And it goes on and on. People who regularly listen to Rush Limbaugh and Sean Hannity, watch Bill O’Reilly and Glenn Beck, and read Ann Coulter and Mark Levin are filled with these kinds of negative stereotypes of liberals. It is no wonder that they would react negatively to someone who openly identifies themself as a liberal. What is WRONG with that person? It makes them wonder. And yet here I am doing just that. What IS wrong with me? Well first, by way of explanation, let me clarify that based on common usage today I would probably be considered very conservative, at least with respect to my personal habits. I am a white, middle-aged male, married with two kids living in Texas. I dress conservatively, wear my hair short and drive a pickup truck. I don’t drink, smoke or gamble. I don’t have any tattoos, body piercings or dyed hair. I go to church regularly (Methodist) and tend to stay home most evenings with my family. The Religious Right would have you believe that Jesus spent all his time on Earth bashing gays, denouncing abortion and condemning “sinners,” when in fact those all-consuming, hot-button issues that define the Religious Right today never came up in any of Jesus’ sermons. Instead Jesus spent most of his time telling people to love one another while preaching forgiveness and redemption. Jesus told us to “turn the other cheek” regardless of how many times we had been wronged and not to cast stones of condemnation unless we ourselves are sinless. We are supposed to care for the poor, feed the hungry, heal the sick, and visit people in jail (as opposed to torturing them, I suppose). If someone asks you for your coat, you give them your shirt too. If someone is lying injured on the side of the road, you stop and help them. Jesus was, in my opinion, the biggest bleeding-heart liberal to ever walk the face of the Earth. OK, some are thinking, granted he was a bleeding heart, but liberal? That still sticks in some people’s craw. Why not a bleeding heart conservative like George W. Bush claimed to be? That is where my pragmatism kicks in. If “bleeding heart conservatism” can accomplish all those things better than bleeding heart liberalism, then I’m sold. I’ll become a conservative tomorrow. But look where eight years of Bush’s policies got us -- an economy that was in total meltdown by the time President Obama took charge. Bleeding heart conservatism might sound good, but as a practical matter it failed miserably, assuming it was even tried at all and wasn’t just a meaningless phrase thrown out to cover up the real plan which was the usual Republican policy of giving big business whatever it wants and hoping for the best. George W. Bush and the Republicans had their chance to put their ideas in place and they failed miserably in nearly every aspect of government policy - foreign and domestic. How could anybody want to go back to that so soon, if ever? The economy performed spectacularly well under President Bill Clinton and then floundered pathetically under President Bush. If things pick up under President Obama by next year, as it is likely to do, I will be hard-pressed to see how anyone could continue to vote Republican in future elections. But I’m sure many still will and there isn’t anything wrong with that. I would just hope that they might start to see through some of those offensive and ridiculous sterotypes that get paraded around out there everyday.